From Camp 4 walk up past Columbia Boulder and into the brush. Find the trail and walk towards El Cap (west) until you come to a dry stream bed. Ascend up this, keeping to it's left, until you meet the cliff. Then walk the cliff base left around the base (where Doggie Do is), up a slope to a right facing corner. Fourth class up this corner to a large oak tree. You\'ll find that continuing along this gets you to Edge of Night. At the tree, you go a little right to the corner. Scramble up this if you like climbing unroped on dirt filled cracks with loose blocks. A rope wouldn\'t be too bad an idea. At the top of this is a nice little ledge under a right facing corner with a tree in it, and a great crack. This is the start of the climb. Amazingly, we used nothing larger than one #4 old BD Camalot. But take a goodly amount of gear in lots of different sizes from small to the #4 as pro is possible along the route. There is a bolt anchor at the top, but until it gets replaced, you'll want to back it up with slings around flakes, and gear such as you can get it. Gary at the belay anchors in this composite picture of the climb. While the 5.10a OW crux is a good one, the "5.7 Chimney" at the top of the climb is the real crux in my opinion. I had my back to the cliff looking out into the Valley and had to figure out how to turn around. The next time I go up this climb (and there will be a next time) I\'d look at doing the turn around a bit earlier. 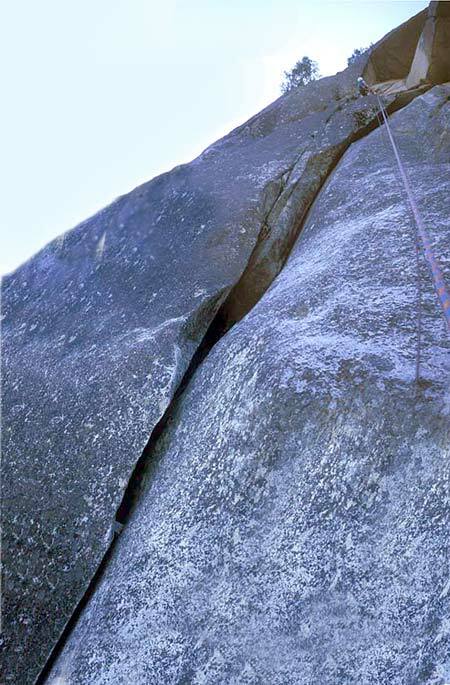 Once you overcome this problem, there are a couple of delicate moves to get over to the belay station.